Thought I’d start discussion on the possibility of good falls next Tuesday and Wednesday. Long way off and i’m Bracing for the usual downgrade but it would be nice if it comes off. Heard a few forecasts from the BOM saying it will be a stronger trough than this week so fingers crossed. BTW getting a nice little shower tonight in Wodonga thanks to a tiny little cell that could! Nice to get another mm or so on top of the 8-9 we got yesterday and last night. last system failed for Northern Country and next system looks much better is Cold upper low combine trough bring some thundery rains and isolated shower of SW winds. Thanks Macman - have you thought of putting your location onto your profile? Something to watch as the conditions develop, would be nice here after 14mm fell yesterday. What are everyone's thoughts for Thursday ? Should we change the date of this thread to include the 22nd ? eg - EC 17mm on Fri re Sale. ACCESS also with less activity, but some rain nonetheless. edit....GFS has an interesting low loitering Thursday for a few days ? Very impressive that Upper low is playing with us. Charts are bit messy between Windy Charts so wait next week. Ill vote for extension as at very least looking like a ripping cold outbreak and then SW airsteam with showers will extend the event for eastern half in right locations till late in the week.Trying to keep a lid on it as been shattered so many times before. Looking like a 2 part event (3 if you count airstream showers as part 3). Part 2 from west to east across the state from later Wednesday into Thursday(maybe a lull for many during the day) this is upper cold pool/trough. Part 3 Mega upper trough helps trigger possibly enormous surface low somewhere making for some serious wind and also showers in a sweet spot that's yet to be determined. LOL fast forward to Mondays 00z run, partly cloudy few showers. Heating up quickly today already up near 28°C at 10am here in Portland. Models still going strong on this event, Access even has a follow up low next Monday which promises good falls again - could be a cold wet 2 weeks. Yeah Ruckle cant wait see how much rain Victoria is needed. No nastie hot weather so far we into cool weather. Around Lunchtime tomorrow is storm chasers hobby start looking from West for development Thunderstorms. Hopefully gets nice and stormy Tommoz arvo. 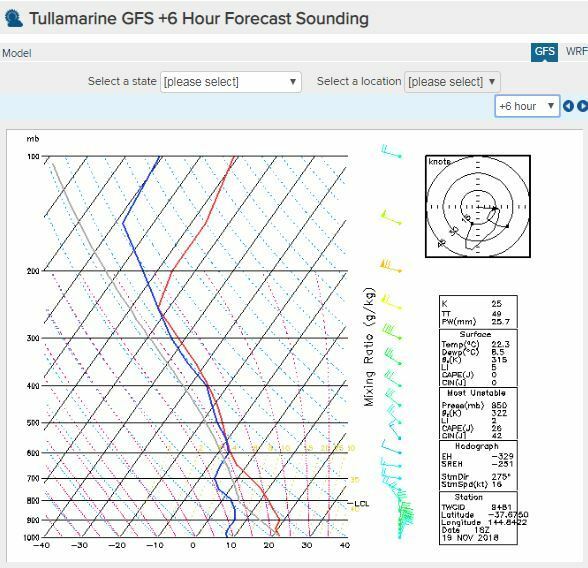 Models all over the shop, but something big is brewing - peaking strongly in areas of Vic yet to be determined! My tip is to watch it all evolve on SatIR. Happy Birthday Ruckle a little while back ? One thing for sure, should do OK compared to other rainfall events this year, could be the best. Fingers crossed for the farmers and water catchments. Thanks I think. 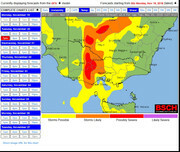 Looking good for catchments and a fair chunk of Gippsland. Still a bit iffy around central parts away from the coast with different scenario's still being thrown up. The turning of the winds in the low to mid levels there stands out to me indicating the potential for some nasty winds with any storms that form. Potential tornado if a supercell gets up somewhere? Anyone else agree? Happy to be proven wrong.